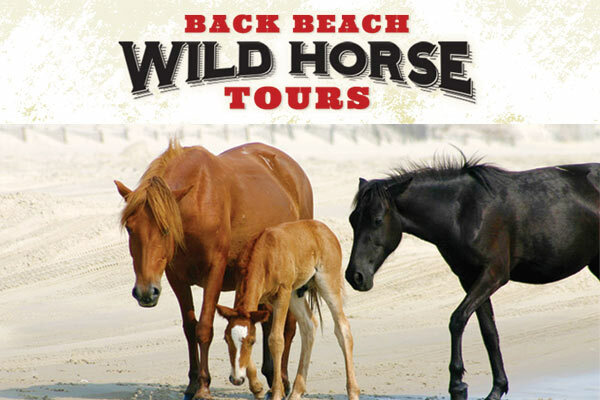 Welcome to Back Beach Wild Horse Tours in Corolla NC. Our tours embark from Corolla NC, the last Outer Banks outpost before the road ends into nothing but stretches of wide beach. We provide safe family fun to see the Corolla Wild Horses, descendants of the Spanish Mustangs brought to the New World by explorers as long ago as the early 1500s. Because we go to their native habitat, you have the chance to experience much more than just a tour to see these majestic beings; you also get stories about the history of this area, a chance to learn about the other wild animals and vegetation of this area…and sometimes even a pirate tale or two! Our guides are entertainers as well as expert horse spotters, and they know how to keep your entire crew engaged and interested, whether they’re little tykes or seasoned travelers. View the horses in our open air Safari-style vehicle. Our tours are safe for all ages; yes, even kids in car seats can go on this trip. Back Beach has large capacity vehicles with seating for up to 14 people. All our trucks transition easily from beach driving to the network of sandy roads and up over dunes. Lots of our guests have said that just the experience of riding with the wind in their hair through the beauty of this wild, open area was a great part of their wild horse tour.